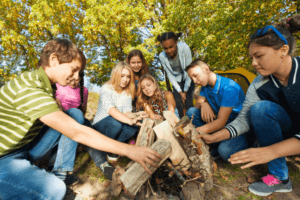 Wilderness Survival Field Trip Programs – Trail Blazer Survival School, Inc. Trail Blazer Survival School provides year-round wilderness survival experiences for the Carolina region and beyond. The mission of Trail Blazer Survival School is to provide outdoor education though hands-on learning in an enhanced natural environment. Our goal is for all students, regardless of age, to leave with a greater understanding, appreciation, and respect for the wild. We provide innovative programs at Trail Blazer Survival School that are tailored for specific age groups and adjusted to to meet the needs of individual groups. This program is approximately 4 hours in length plus the amount of time you want to allow for lunch. We provide a picnic shelter, two porta-potties, 1 instructor for every 15 students, materials for any crafts that will be made, and more. For more details check out the course description. To book an event, call 864-263-3850 or click here to contact us. Field Trip Program is approximately 4 hours in length plus the amount of time you want to allow for lunch. We provide a picnic shelter, two porta-potties, 1 instructor forevery 15 students and materials for all projects that will be completed during the event. For more details check out the course description.